There's nothing quite as romantic as candlelight at a beach side setting. 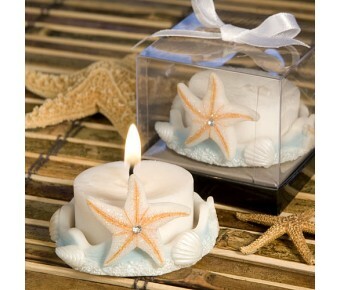 And with these stylish beach themed candles, your guests can have that breezy feeling each time they light them up. 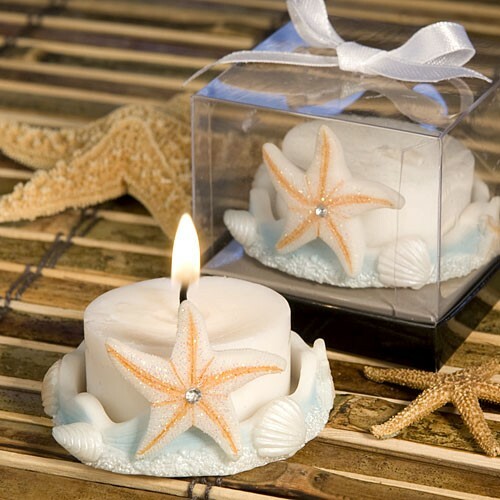 Each 1.25" x 2" favor has an included tealight nestled in an iridescent finish white poly resin raised shell-encircled base finished with a dramatic central starfish with natural and sea blue colorings and a shimmering clear rhinestone at its center. Offering a wide selection of inexpensive favors that are rich in style, Fashioncraft's exclusive Favor Saver Collection has something that's just right for every occasion. Each comes packaged in a black bottomed gift box with a clear top and gray insert, attractively accented with an attached white satin bow.